I have read Tex Willer comics since my pre-teen years in school. 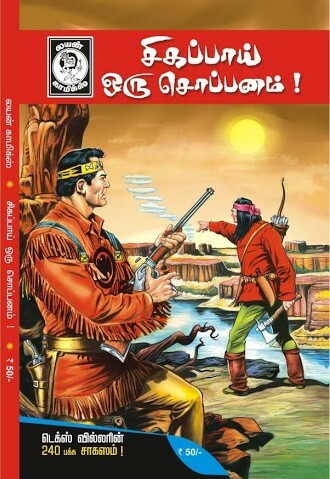 It is a spaghetti western – western comics published by an Italian publisher. The first Tex Willer comic came out in 1948 and the publisher says that around 625 books have come out till now. The series follows the adventures of Tex Willer and his pals – Kit Carson, his longtime friend who has a wonderful sense of humour, Tiger, his Navajo friend and Kit Willer, his own son. Most of the adventures are set in Arizona and so the Grand Canyon keeps coming up in one form or another in the stories. Tex Willer’s wife was from the Navajo tribe and after he married her he became the head of the Navajo tribe. (His Native American name is ‘Eagle of the Night’.) So he is in a unique position to see the good and the not-so-good things on both the sides – the Native American side as well as the European settlers’ side. A typical Tex Willer story involves a few bad guys who try to destroy the fragile peace which exists at present by provoking people or indulging in violent and unlawful activities. Tex Willer and his friends arrive on the scene, fight against the bad guys, carry out daredevil actions, which are realistic, and come out trumps in the end. I picked the present book a couple of days back because I was in the mood to read a comic and I finished reading it in one sitting. Here is what I think. ‘Sigappai Oru Soppanam’ starts with a young prophet from one of the Native American tribes having a vision. This man’s name is Manitari. In his vision the goddess of his tribe says that the sun will become dark soon but it will brighten up again and when it brightens all Native American tribes will be able to fight with the white settlers and drive them away from their land and the old order will return back. Manitari goes to his village and tells everyone about his vision. He also goes to the villages of other tribes and describes his vision. One day the sun gets dark, because of an eclipse. Then most of the Native Americans who have heard of Manitari’s prophecy start believing in him. Manitari’s tribe gets smuggled guns and organizes itself into an army to fight with the army forces at the fort nearby. Tex Willer and his pals enter the scene here. The commandant of the fort invites them to discuss this with them. However they are ambushed by Manitari’s armed warriors on the way before they are saved by the army from the fort. 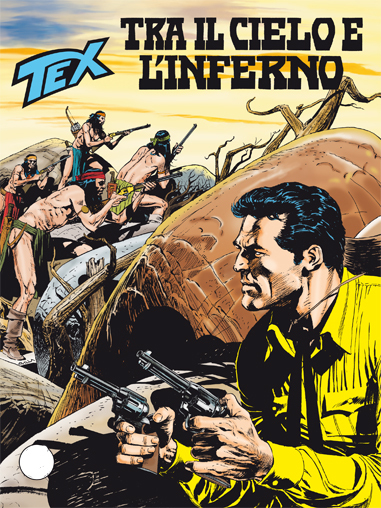 Tex Willer and his companions talk to the fort commander and make a plan to foil Manitari’s designs to upset the existing fragile peace, which has been built in the area after many years of effort. Will Tex Willer and his pals succeed in their efforts? The answer to this question forms the rest of the story. ‘Sigappai Oru Soppanam’ is vintage Tex Willer – it has everything that one expects in a Tex Willer comic. The book is long – around 240 pages. The initial action scene where the Native American warriors ambush Tex Willer and his pals is action packed and gripping. The illustrations – the portraits which show the wrinkles on the faces, the horses’ hooves, the shooting fights, the silhouettes – are brilliant, wonderful, breathtaking, lifelike. In many places in the action scenes, there is no dialogue – it is like watching an action movie. Kit Carson’s humour lightens the tension and makes us smile. The old fox has still not lost his touch J There are many vintage campfire conversations. There are no major women characters in the story – like it normally is in a typical Tex Willer comic. There is one young woman character in this book though, who comes for a brief while and plays an important role. The only complaint I have about the book was in the way Manitari was portrayed – he is a man who was bullied when he was a boy, and got away from his tribe and went to the wilderness to meditate and had visions. He is sincere in his efforts and in wanting his people to regain their glory days. He doesn’t look like a villain to me – or atleast definitely not a black-hearted one. But the ‘good’ characters try to portray Manitari as the main villain, in their conversations. I don’t know whether this was the intention of the original creators of this story or whether this has crept in during the translation. Eventhough I didn’t want Manitari’s designs to succeed, I felt sorry for him in the end. If you like a rip-roaring western adventure with lots of gunfights you will love this. It is a pity that it is not translated into English. Have you read ‘Sigappai Oru Soppanam’ (‘Tra il cielo e l’inferno’)? What do you think about it? I first encountered ‘Les Misérables’ by Victor Hugo, when I was in school. I read an excerpt from the book, which was about how Jean Valjean steals the silverware from Bishop Myriel’s house and when the police catches him, the Bishop bails him out by saying that he gifted them to Jean Valjean. I can’t remember whether I read it in an anthology or whether it was part of my English textbook. I also remember the classic way in which the book is introduced – that it is about Jean Valjean who was sent to prison for nineteen years for stealing a loaf of bread. I always wanted to read the rest of the story and find out what happened to Jean Valjean after the bishop helped him, but I never got around to that. I also remember, during schooldays, seeing an abridged version of ‘Les Misérables’ at a friend’s place. When I asked my friend about it, he said that it was his favourite book and he read it once every couple of months. I admired his passion for the book when he told me that. I remember wanting to borrow the book from him at that time, but I can’t remember whether I actually borrowed it or not. When I got in touch with this friend again sometime back, after many years, I asked him whether he still read ‘Les Misérables’ once every two months. He smiled and said that he didn’t have the time now. He is one of the leading surgeons in the city now, and so is hard-pressed for time, but behind the face of the famous surgeon I could see that young boy who used to read ‘Les Misérables’ passionately and take an adventurous and heartbreaking roller coaster ride with Jean Valjean. A couple of weeks back, I had a strong impulse to open some old boxes with books in them. Some of these boxes were ten years old. I have shied away from them because I knew that if I opened one of them it will be like opening Pandora’s box – I will want to take all the books out and read all of them. There was also no room in the house for more books as books were already overflowing from the shelves onto the floor. But I couldn’t resist the temptation this time and opened one of those old boxes. Inside the box, on top, was Victor Hugo’s ‘Les Misérables’. With the film version creating waves right now, I couldn’t resist taking out the book and starting to read it. It is 1260 pages long and so it is a real chunkster. Whenever I finish it, it will be the second longest book that I have ever read, replacing ‘Gone with the Wind’ which currently occupies that position at 1100+ pages. I thought I will ‘test read’ it for a couple of days and see how it went and then decide whether to continue reading it further. Before I knew, I was hooked to it. The book has five parts and I finished reading the first part of the book yesterday. Here is what I think about the first part. Victor Hugo published ‘Les Misérables’ when he was nearly sixty. That is really interesting. The first fifty pages of the book talk about Bishop Myriel. Jean Valjean makes an appearance in the book only after fifty pages. Bishop Myriel is one of the noblest characters that I have ever encountered in a novel. Probably the noblest ever. Someone who gives away everything he has to the poor, sick and the needy, someone who thinks that all human beings have a good heart and who changes the hearts of thieves and robbers with his thinking, someone who doesn’t have the trappings of power but lives a very simple life. The popular version of Jean Valjean’s story is that he was sent to prison for nineteen years for stealing a loaf of bread. But while reading the book, I discovered that Jean Valjean was sent to prison for five years for stealing a loaf of bread. It is still bad. His sentence was increased everytime he tried to escape from prison and he ended up being in prison for nineteen years. The second name of Jean Valjean is probably a short version of ‘Voilà Jean’. The first part of the book, ‘Fantine’, has two plot arcs. The first is the story of Bishop Myriel and how Jean Valjean meets him for the first time after getting released from prison and how that encounter transforms Jean Valjean’s life, how Jean Valjean takes on a new identity and is called Monsieur Madeleine and works hard and becomes a rich man and even becomes the mayor of his city and how a police inspector called Javert suspects the truth about Monsieur Madeleine’s past. The second plot arc is about a young woman called Fantine who is abandoned by her lover when she is pregnant and how she has to leave her child in the care of strangers when her child is three years old to go to work, how her child suffers in her foster home and how Fantine’s life itself takes a downward spiral. The two plot arcs come together when Monsieur Madeleine has to confront Inspector Javert to save Fantine from being imprisoned and things become complicated after that and the situation comes to such a pass that Monsieur Madeleine has to reveal his own past and get arrested to prevent an innocent person from being framed. At some point in the story, I felt that Monsieur Madeleine started resembling Bishop Myriel – the noble soul who works for the community and who gives money away to the poor. Those numbers told an interesting story. I couldn’t believe it when I saw it first, but it looks like ‘Les Misérables’ probably has the highest word density (number of words per page) out of the books I have. No wonder, the reading was slow going. The character of Inspector Javert is quite interesting for a particular reason. There used to be an old Tamil writer and actor called ‘Javer Seetharaman’. He was probably the first writer to write horror novels in Tamil. He also acted as a detective in movies, the most famous of which is ‘Andha Naal’ (‘That Day’). I used to wonder where his name ‘Javer’ came from because it is not a Tamil name. Now after reading about Inspector Javert, I can see the source of the inspiration. 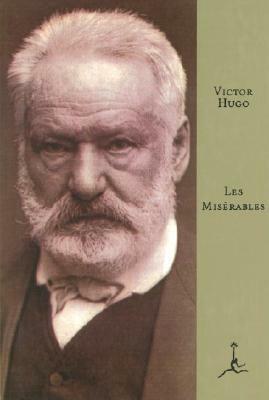 Victor Hugo’s picture on the cover of the book seems to indicate that he is a serious man who smiles rarely. The book though says otherwise. There are lots of beautiful passages which describe children and insightful passages with gentle prose and beautiful thoughts. Clearly appearances are deceptive. I discovered a chronological inconsistency in the story. When Fantine gets pregnant, it is the year 1817. When she leaves her daughter Cossette with the Thénardiers, Cossette is two or three years old. Then she goes to work in Monsieur Madeleine’s factory in another city. This year is indicated to be 1818. A simple calculation reveals that this is not possible. It should be atleast 1820 or 1821, depending on whether Cossette was two or three years old at that time, when Fantine goes to work in the factory. This inconsistency with respect to Fantine’s life continues till the end of part 1. I don’t know whether Victor Hugo missed it out here or whether there is a problem in the edition I have or whether there was a problem in translation. If Victor Hugo got it wrong, I am sure there are papers written by literary critics which describe how and why he got it wrong or even how he is right inspite of being chronologically inconsistent and what he actually meant by getting the years deliberately wrong. I loved the first part of the book, ‘Fantine’. There are interesting anecdotes, noble characters, beautiful passages, sad events and a tragic ending. I can’t wait to find out what happens to Jean Valjean next. …they were students, and to say student is to say Parisian; to study in Paris is to be born in Paris. Table talk and lovers’ talk equally elude the grasp; lovers’ talk is clouds, table talk is smoke. Let us say by the way, to be blind and to be loved, is in fact, in this earth where nothing is complete, one of the most strangely exquisite forms of happiness…You see nothing, but you feel adored. It is a paradise of darkness. It is certain that we talk with ourselves; there is not a thinking being who has not experienced that. We may say even that the word is never a more magnificent mystery than when it goes, in the interior of a man, from his thought to his conscience, and returns from his conscience to his thought. It is in this sense only that the words must be understood, so often employed in this chapter, he said, he exclaimed; we say to ourselves, we speak to ourselves, we exclaim within ourselves, the external silences not being broken. There is a great tumult within; everything within us speaks, except the tongue. The realities of the soul, because they are not visible and palpable, are not the less realities. Diamonds are found only in the dark places of the earth; truths are found only in the depth of thought. It seemed to him that after having descended into these depths, after having groped long in the blackest of this darkness, he had at last found one of these diamonds, one of these truths, and that he held it in his hand; and it blinded him to look at it. To sum up, events were rare in his life. We relate those we know of; but usually he passed his life in always doing the same things at the same hours. A month of his year was like an hour of his day. What was more needed by this old man who divided the leisure hours of his life, where he had so little leisure, between gardening in the day time, and contemplation at night? Was not this narrow inclosure, with the sky for a background, enough to enable him to adore God in his most beautiful as well as in his most sublime works? Indeed, is not that all, and what more can be desired? A little garden to walk, and immensity to reflect upon. At his feet something to cultivate and gather; above his head something to study and meditate upon; a few flowers on the earth, and all the stars in the sky. These are true pleasures. These passages in the lives of happy couples are a profound appeal to life and nature, and call forth endearment and light from everything. There was once upon a time a fairy, who created meadows and trees expressly for lovers. Hence comes that eternal school among the groves for lovers, which is always opening, and which will last so long as there are thickets and pupils. Hence comes the popularity of spring among thinkers. The patrician and the knife-grinder, the duke and peer, and the peasant, the men of the court, and the men of the town, as was said in olden times, all are subjects of this fairy. They laugh, they seek each other, the air seems filled with a new brightness; what a transfiguration is it to love! Notary clerks are gods. And the little shrieks, the pursuits among the grass, the waists encircled by stealth, that jargon which is melody, that adoration which breaks forth in a syllable, those cherries snatched from one pair of lips by another – all kindle up, and become transformed into celestial glories. Beautiful girls lavish their charms with sweet prodigality. We fancy that it will never end. Philosophers, poets, painters behold these ecstasies and know not what to make of them. So dazzling are they. The departure for Cythera! Exclaims Watteau; Lancret, the painter of the commonalty, contemplates his bourgeois soaring in the sky; Diderot stretches out his arms to all these loves, and d’Urfé associates them with the Druids. Have you read ‘Les Misérables’ by Victor Hugo? What do you think about it? While stepping into this year, I realized that I haven’t read a lot of French literature. This thought was born when I read ‘Flaubert’s Parrot’ by Julian Barnes and it intensified over the past few weeks. So, I thought I will read more French books this year – do a sort of French themed reading this year – in addition to reading my regular favourites, English, American and German books. So, I looked at my bookshelf and took out books which were written by French authors. They were not that many when compared to the English books I have, but there were a surprisingly good number of them. Then I did some research, asked some friends, asked some fellow book bloggers about French literature and got more books. Finally I decided on my first French book of the year. It was ‘Le Père Goriot’ by Honoré de Balzac. I finished reading it yesterday. Here is what I think. ‘Le Père Goriot’ is set in a boarding house in a not-so-sophisticated district in early 19th century Paris. The story follows the lives of some of the boarders in the boarding house. There are two main stories that the book focuses on, however. One is that of an old man who loves his daughters so much that he is ready to do anything to make them happy. He helps them get married to rich men, gives away all his wealth to them, and even after his daughters ignore him when they realize that he doesn’t have anything, he goes on loving them and helping them whenever they are in trouble. The other main story is about a young man Eugène Rastignac, who comes to Paris to study law and who sees the glamour and flamboyance of Parisian society through the help of his distant cousin Madame de Beauséant. Madame de Beauséant helps him in getting introduced to Madame de Nucingen and Eugène promptly falls in love with her. But Parisian society extracts its own price from Eugene as he ignores his studies and his condition oscillates between having a lot of money in his pocket and being in the company of fashionable Parisians and being in deep debt. Eugène also discovers that Madame de Nucingen is Goriot’s daughter. What comes of Goriot’s love for his daughters and Eugène’s love for Madame de Nucingen form the rest of the story. 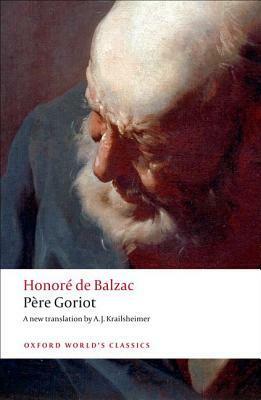 ‘Le Père Goriot’ was my first Balzac and so I was really excited about it. I am glad to have picked it up because I loved the book. The story of Goriot had shades of ‘King Lear’ and the ending was tragic as expected. But the more interesting story strand for me was that of Eugène Rastignac, who comes from a village to Paris to study and hoping to make a living there. There is something romantic about a small town man trying to make it big in the city. There is also something tragic about how he loses his innocence, succumbs to the temptations of the city and its ways and it is painful to watch him go through crises of conscience at the end of which most times he makes the decision which is practical but which more or less kills his simple, innocent provincial self. It is fascinating to read what happens to Eugène Rastignac. If we strip away the specifics – early 19th century Paris, the salon culture, the balls and the parties – and move the story to the 21st century world of today, it still works, it is still powerful and it still makes one think. That, I think, is the genius of Balzac. I also loved Balzac’s prose – I have to digress a little bit here. When we say we love a writer’s prose, we probably mean one or more of these things – the wordplay, the images described, the similes and the metaphors and the insights provided by the writer in which we are able to see ourselves or our own world. I am not sure about the wordplay in this book, because a lot of it is lost in translation, but I loved the other three aspects of Balzac’s prose. My favourite characters in the story were Eugène Rastignac, Madame de Nucingen (she is alternately noble and selfish, which makes her a really fascinating character) and Vautrin. Vautrin is, supposedly, the villain of the story. Interestingly, he speaks some of the most powerful lines in the story. I liked Vautrin very much for his wise words, for his confidence and for his loyalty to friends. Of all the great novelists that have enriched with their works the spiritual treasures of the world, Balzac is to my mind the greatest. He is the only one to whom I would without hesitation ascribe genius. Like all novelists, he wrote of the wicked more successfully than of the good. It is generally conceded the he wrote badly…Balzac had no feeling for the elegance of his native tongue. Some of the above observations look contradictory (Balzac fans will definitely dispute the claim that he wrote badly and had no feel for the elegance of his native language), but when read in context in the Maugham essay, they ring true. I also read a little bit about Balzac’s project of combining all his work into one project called ‘La Comédie humaine’ with the result that many of the characters in one book make appearances in other books. This was probably the origin of the modern serialized story – one story followed by multiple sequels. Though I am guessing that Balzac didn’t plan them as sequels but as stories which depicted the lives of people in the Paris of that time and though some characters make appearances in multiple books, the main characters in different books are different. I have to also say something else about Balzac. One of the first things I read about Balzac was his love for coffee. I read this in Anne Fadiman’s essay called ‘Coffee’ (featured in her essay collection, ‘At Large and At Small’). This is what the essay said. But in the realm of twitching eyeballs, even Stewart Lee Allen can’t hold a candle to Honoré de Balzac, the model for every espresso-swilling writer who has followed in his jittery footsteps. What hashish was to Baudelaire, opium to Coleridge, cocaine to Robert Louis Stevenson, nitrous oxide to Robert Southey, mescaline to Aldous Huxley, and Benzedrine to Jack Kerouac, caffeine was to Balzac. The habit started early. Like a preppie with an expensive connection, he ran up alarming debts with a concierge who, for a price, was willing to sneak contraband coffee beans into Balzac’s boarding school. As an adult, grinding out novels eighteen hours a day while listening for the rap of creditors at the door, Balzac observed the addict’s classic regimen, boosting his doses as his tolerance mounted. First he drank one cup a day, then a few cups, then many cups, then forty cups. Finally, by using less and less water, he increased the concentration of each fix until he was eating dry coffee grounds : “a horrible, rather brutal method,” he wrote, “that I recommend only to men of excessive vigor, men with thick black hair and skin covered with liver spots, men with big square hands and legs shaped like bowling pins.” Although the recipe was hell on the stomach, it dispatched caffeine to the brain with exquisite efficiency. From that moment on, everything becomes agitated. Ideas quick-march into motion like battalions of a grand army to its legendary fighting ground, and the battle rages. Memories charge in, bright flags on high; the cavalry of metaphor deploys with a magnificent gallop; the artillery of logic rushes up with clattering wagons and cartridges; on imagination’s orders, sharpshooters sight and fire; forms and shapes and characters rear up; the paper is spread with ink. I am glad that I read my first Balzac. I loved the experience. I can’t wait to read more. The other three Balzac books I have in my collection are ‘Lost Illusions’ (at around 700 pages, it is a mini-chunkster), ‘Droll Stories’ and ‘The Girl with the Golden Eyes’ (novella). I am hoping to get to them soon. Like many people bored with life, almost the only pleasure left for Monsieur de Beauséant to enjoy was eating well. …she was like so many people who mistrust those close to them and confide in the first stranger they meet. A curious, but true fact about behaviour whose origin is readily identifiable in the human heart. Perhaps certain people have nothing more to gain from those with whom they live; once they have revealed to them their inner emptiness they feel that they are being secretly judged with well-deserved severity, but, desperately craving the compliments they need, or obsessed with the desire to look as though they possess qualities which they do not, they hope to win by surprise the esteem or affection of strangers, at the risk of one day forfeiting it. There are also individuals who are born mercenary and do nothing to benefit their nearest and dearest, just because that is their duty, whereas by rendering some service to strangers they feel better pleased with themselves. The closer the circle of their friends or relatives is to them the less they like them, the wider the circle extends the more obliging they are. Madame Vauquer no doubt had something of both these natural types, essentially mean, false and detestable. Have you read ‘Le Père Goriot’? What do you think about it?